The Permanent Multipurpose Module (PMM) was successfully relocated from the Unity module to the Tranquility module at 9:08 a.m. EDT Wednesday. 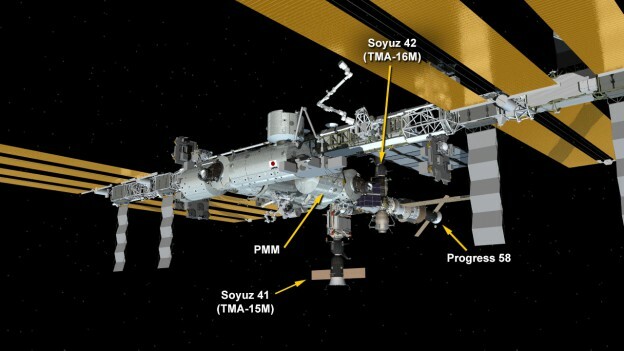 The PMM was robotically relocated from the Earth-facing port of the Unity module on the International Space Station to the forward port of the Tranquility module in the next step to reconfigure the complex for the future arrival of U.S. commercial crew vehicles. Robotic flight controllers at Mission Control, Houston, working in tandem with the Mobile Servicing System (MSS) Operations Center at the Canadian Space Agency’s headquarters in St. Hubert, Quebec, Canada, used the Canadarm2 robotic arm to maneuver the 11-ton module a short distance to its new location. Expedition 43 Commander Terry Virts and Flight Engineer Scott Kelly of NASA supervised the commanding of the bolting of the PMM to Tranquility. The PMM’s hatch will be reopened tomorrow. The operation opened the Earth-facing port of Unity as another berthing location for U.S. commercial cargo vehicles. Future U.S. commercial crew vehicles will arrive at the space-facing and forward ports of the Harmony module, which will continue its transformation later this year when a pair of International Docking Adapters (IDAs) will be delivered on the seventh and ninth NASA-contracted SpaceX cargo resupply missions. The IDAs will be attached to Pressurized Mating Adapters 2 and 3, enabling the station to host up to two U.S. commercial cargo and two U.S. commercial crew vehicles at any given time.